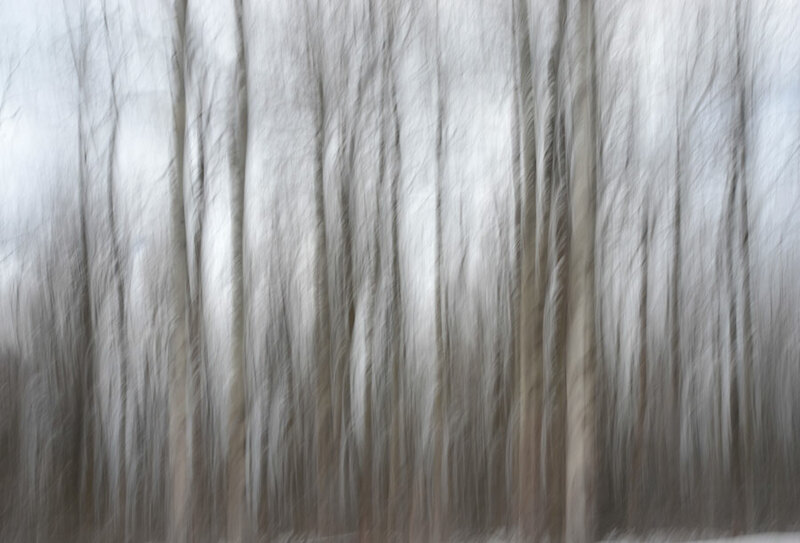 Viewed this way, the trees take on individual personalities, all the while clinging to one another so they may dance. I like this – a lot! But I would like to see it with a hint of colour. Thanks, Christian. They are fun to make. Very effective and beautiful result ! Thank you, Yoshizen. That photograph must have been effective for you to remember it for so long. Sounds interesting. Love this, Karen. I can see a big hand sweeping across those trees, like grass. Like it…. Like it a lot. The blurriness is balanced right and works well. Nearly all of your photos are amazing and beautiful, but this has something extra. Lovely, are they poplars? They have poplar colours. Thank you, Anne. There were a mix a birch and poplars, I think, although the birches were thin and don’t really show up so much! Wonderful use of the thirds rule in both dimensions. It’s almost like a pencil drawing on embossed wallpaper. Great effect Karen. Hi David, thanks very much. I like your interpretation and I’m happy you like it! Great, subtle use of color, Karen. Suits the subject perfectly. Hi Alessandro, thank you. I do tend to love the subtle tones. Love your painterly abstracts. The rise of color from browns and grays to white is very effective. I want to walk right in. Beautiful image, Karen. Thanks very much, Jane. I really appreciate your kind comment. This really reminds me of Twin Peaks – the trees look as if they are turning into curtains. It’s a wonderful textural shot. Ha, Twin Peaks – I guess it could have a bit of that feel. Nunca Se Me Ocurriría Hacer Una Fotografía Así… Sin Duda Me Gusta mucho… Un Saludo. There’s an amazing effect in these, they become almost 3d the more you look into them.. Thanks, Cath. Yes it’s sort of interesting the way the movement wraps around the trees – you never know how these sort of images might turn out! My kind of image. Great. I’m happy you like it, thank you! magical scene….The combination of a title and a photograph extends the world. Love it! They seem to be moving. I like that this photo can be interpreted in different ways – both peaceful and a bit scary. Looking at this I feel like I’m watching a film at a very dramatic moment. A tension, I guess? Thanks for your comment, Steven.